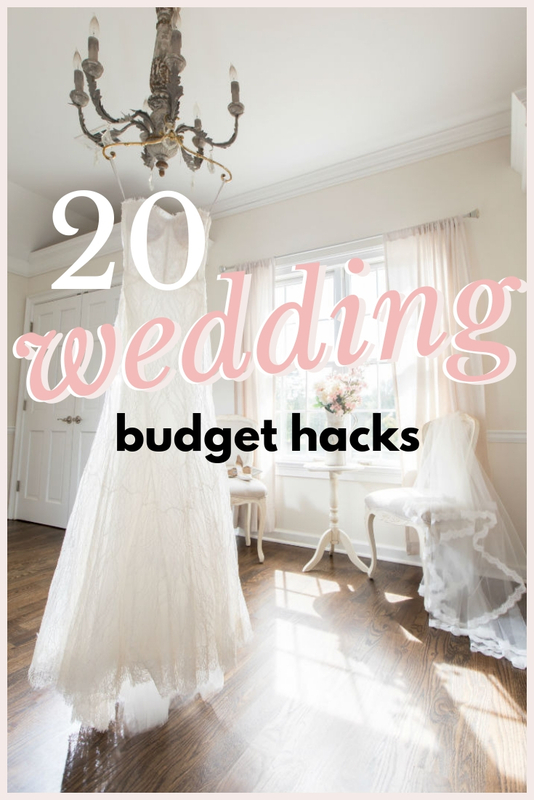 I’m sharing 20+ ways I saved money in my wedding budget because although no two wedding budgets will look the same, I think this post can help any bride-to-be planning their wedding. Some of the areas I saved in may be your top priority, but it’s helpful to share to give you ideas in areas you can potentially save! It’s important to allocate your wedding budget to your top priorities first, and realize that there will be some give towards those and take away from areas not as important in your budget. I actually wrote this post right after my October 2016 wedding but never finished it because I wanted to post it with a video and I was never happy with how it turned out. Today is finally the day! Here are 20+ tips and tricks I used to save in my wedding budget. A wedding is a family affair, so don’t be shy asking your creative family member or friend for help! I had a few family members help me with different decorative DIY’s. My aunt worked in the Kroger floral department for years, so hiring her as my florist was a big chunk of savings. My Mom and I ordered the flowers wholesale and rented out a floral fridge at Reeves in Woodstock where my aunt could have all the supplies readily available to bring my Pinterest inspiration to life. My Dad, Brother, and Uncle made the wood cross for our ceremony. They purchased wood and stain from Home Depot for $40, which was a savings of $110 compared to renting the cross at my wedding venue for $150. Plus, we can always sell the cross to another bride to be to make our money back. My cousin made the stickers for my table numbers and we put them on acrylic supplied by my Mom’s art and framing gallery for a simple table number DIY. This is the image that inspired me and you can see how they turned out in my Wedding post. I also shared my pinterest wedding inspiration versus reality if you want to see how all of my ideas came to life. I had a few extra hands the day of the wedding to help decorate the venue with my coordinator so my Mom and I could enjoy the day getting ready together. My cousin was a big help getting extra fabric needed for the tables and ceremony, while my aunt with an interior design background put the finishing touches on the tables and fireplace. We had a dear friend officiate our wedding day, a very sweet wedding gift if you’re open to the idea! Since I have a nice blog camera, my Mom shot our engagement photos while we were in Savannah for my graduation and I edited them. If I wasn’t happy with how they turned out I knew I could always hire my photographer to do them for around $400. Of course, this won’t work for everyone, but if you own a business that could be valuable to another vendor in the wedding industry don’t hesitate to ask! My Mom had a gallery client with a production company, so they bartered and we got our wedding videographer for FREE! We ended up trading the DIY table numbers with my wedding coordinator for her last-minute thank you note design at each table setting. Side note, I hired her 3 days before the wedding and she made it work. I think having a coordinator is crucial to your budget. We got married on a Friday, and nearly all the venues we looked at offered a discounted rate for non-Saturday weddings. My venue was the least significant discount, but it still saved $500 from the rental which adds up. Another venue I looked at was $2,000 cheaper for a Friday night! You can also ask vendors if they offer an extra discount for non-Saturday wedding dates, although none of mine did. Most of the vendors discounted 10-15% off when I offered to pay them in cash, and my photographer took a little more off for me to pay him in full verse half of the deposit. Just remember to keep all of your emails and contracts to be safe! I didn’t feel the need to spend the money on save the dates and just texted my close friends instead. Plus, almost everyone in my family knew the date just by word of mouth. To me, it was just an added cost and an extra task on my to-do list. That easily saves $150-200 between taking photos for the card, purchasing the save the dates, and postage + envelopes to send them out. If skipping this is not an option for you, you can also send one out electronically in an email. We also opted out of wedding programs and instead had a new local calligrapher write out the wedding party on a mirror. Check non-wedding websites like Facebook and Neighbors when looking for more budget-friendly vendors if you have a tight budget. Calligraphy for the envelopes and signs everywhere was out of my budget, but we found someone to do a few signs the week of the wedding for under $100 on Neighbors. It’s also important to consider the weight of your invitations because the more you include in them the more your postage will be. I opted out of purchasing the accommodation and direction cards from my suite, and instead purchased little business cards from Zazzle to direct people to my wedding website for that information instead. Something I didn’t do but wish we did was having guest RSVP online instead of through the mail. I dreaded the thought of stressing over stuffing favors the day before my wedding. In fact, I didn’t because I opted out of having wedding favors. If you’re a huge gift giver, you’ll probably cringe at the thought. I’m starting to see less of wedding favors at my own friends’ weddings, too. I passed on extra decor rentals and the valet at my venue. Instead of renting a $20 sign, try to find one you like on Etsy instead! That way you can re-sell it after your wedding or use it as a special piece in your new home together. We saved in this area two ways. Our ceremony and reception were in the same place, so we didn’t need to worry about transportation for the bridal party between venues. It also takes out more vendor costs to travel between two venues, something I had no idea about before booking them. Tim and I also decided against renting a vintage car to leave in. I love the cute pictures, but not enough to take it from my dress budget 😉 If you know you won’t be able to drive the night of your wedding, there is always Uber! This wasn’t an issue with the location of my venue, but it’s also important to know that some vendors will charge mileage if your venue is outside of their radius. I’m not sure how much this “saved” because we didn’t get a quote for it but we didn’t do a grooms cake because Tim doesn’t even care about dessert. We did have a warm chocolate chip cookies + milk station but that was all my request 😉 Don’t feel like you need a grooms cake just because it’s tradition. If you’re worried about variety for guest, you can probably have two-three different flavors for your wedding cake at no extra cost. The menu is another way to drastically affect your budget. There are so many ways you can cut + add to this area based on your choices, so crunch the numbers and don’t hesitate to ask for multiple estimates based on different selections. My wedding coordinator also told me to go a bit under the actual guest count by 10ish because they usually plan to have a little extra just in case. We opted for a buffet style verse a seated dinner to save few hundred dollars on the service fee. Having a seated dinner means you need to hire more staff to pre-set and hand out dinner plates. Of course, this is one way to make your wedding feel more formal so the choice will be different for everyone. You can also adjust the time of your wedding and serve breakfast or hors-d’oeuvres if you don’t want to pay for a full-service dinner. Of course, it’s important to pick all of your close friends for your bridal party, but do keep in mind that the more you have in your party it will trickle down into your budget with florals and gifts. Also, I recently learned if you have a large bridal party that will also have a role in your beauty timeline the day of. My sister-in-law is having to extend the time we get in the bridal suite and hire an extra makeup artist to accommodate her crowd, something I wouldn’t have thought of! Our wedding was about 30-40 minutes from our new place, so we decided to stay there instead of booking a hotel room. Tim waited until the wedding night to “move in” and I absolutely loved waking up in our new home as husband and wife for the first time. Ask your newlywed friends if they have anything you can use for your wedding! Everyone needs something borrowed and decor usually gets put away in storage until it’s handed off or sold. I literally saved $1000 by getting my veil off of Etsy. My bridal store showed me a gorgeous matching veil with extra lace from my dress, but I was like heck-to-the-no on spending that much for something that drags the leaves and pine straw as I walk down the aisle, haha! But seriously, I would definitely recommend checking out Blanca Veils for a custom-made veil. You can watch my bridal accessories video here to see more of my wedding accessories. The guest list is the single most effective way to save money from your budget. We didn’t extend out a plus one to everyone, unless they were an established couple of over a year or if they wouldn’t know anyone else at the wedding. Just because it’s a wedding doesn’t mean you have to incorporate every aspect of a wedding. You hate the garter toss? Don’t have one! Don’t spend money on things that aren’t important to you and your groom. Ask on local websites (neighbors, Facebook wedding groups or Facebook friends) for vendor advice. I found my calligrapher last-minute (the week before) on Neighbors and because she was just starting her business we had all of our signs done for $100! There will always be someone in your budget, so don’t just look at the big wedding websites to find your vendors. I became close friends with HomeGoods and TJ Maxx when I started wedding planning. I picked up a ton of little decor items from here throughout the year. Always be on the lookout for ways to use decorative items you would want in your home one day. I found a small gold console table to put our table seating chart on and now it’s sitting in our dining room! I even found my guest book during a HomeGoods trip. I was actually shocked at how expensive it was to have a professional photo booth. Plus, I didn’t think I would have liked it aesthetically. This is something you can easily DIY if you really want to have one, but I opted for a few selfie sticks during the reception instead. Tim and I didn’t get each other an extra wedding gift other than the rings we exchanged at the altar and a note to each other before the ceremony. If you start the wedding planning process towards the end of the year, try to book as many of the big vendors before the New Year. Most of them set their new pricing during this time. Any wedding budget hacks I missed? Leave them in the comments below to help our future brides-to-be!